Is your goal simply to make sure that you are using the equipment you already have to its full potential? Or are you ready to upgrade your current technical systems? Maybe you're launching a new building project and you need somsone to partner with you on the technical systems that will support your ministry. Or maybe your crew just wants to learn from someone who has lived (for years) right where they are. Whatever your goal, TMS is prepared to come alongside you and help you get there. We will be your advocate, your partner, your friend throughout this project and long afterwards. We can help you achieve the level of technical excellence that you have envisioned without losing sight of your budget realities. Getting the Most From What You Already Have! I started this company in 1981 in response to churches asking me to help them get the most from the equipment they already had to use. That's a perfect role for me. Since I don't sell any equipment, I'm not tempted to sell a church stuff they don't need. In the majority of cases, I can resolve concerns that a church has by making certain adjustments to their equipment and/or showing their crew on how to better use their gear. Rare is the church whose loudspeaker system doesn't need a tune-up. And often the church isn't even aware of the problem. Oh the stories I could tell you. Like the church in Long Island, New York that asked me to help improve their sound. Within moments of listening to the system, I realized that the high frequency drivers in all four of their main loudspeakers were blown. So all the sound clarity was missing. All vocals sounded muffled. I asked the volunteer sound tech how long they had been that way. He shrugged his shoulders and replied that he had been there for five years and the system had always sounded like that. What!?! We had those high frequency drivers replaced with new units that same day and all were amazed at the improvement. In that case, the high frequency drivers were blown. But the reality is that all loudspeakers fatigue over time, especially if pushed hard. That directly impacts the quality of sound your congregation hears. If your loudspeaker system has been in use for more than a couple of years without having been tuned by a seasoned professional, it is highly likely that you are not hearing the quality of sound that your system is capable of. My Dad was fond of the phrase "pay me now or pay me later," and over the years I've found that to be so true. And it turns out that preventive maintenance is money well spent. The best thing you can do to keep your loudspeaker system sounding its best is to have it tuned at least once every two years. Bring us in for a day to re-voice your system, and let us apply our 30+ years of experience and thousands of dollars worth of first class analysis gear to pull the best sound out of your system. You'll be very glad you did. The most common phone call that I receive is from a church requesting an onsite evaluation of their room acoustics and technical systems. It is the natural step towards the goal that I just described of getting the most out of the equipment you already have. Here's how it typically unfolds. In advance of the trip we would talk at length about your current technical systems and the kinds of challenges you are experiencing. I would also ask you to send me several photos of the room and the technical systems to help "tell the story". With those concerns in mind, we can determine if I can best serve your needs during a one, two, or three-day visit. If the issues are simple, a day trip might be all that is needed. But scheduling it over a two or three day weekend has significant advantages. Assuming it is a weekend visit, I would arrive at your church on a Saturday morning and invest most of the day gathering acoustical measurements of the sound system and how it interacts with the room acoustics, re-voicing the loudspeaker system as needed, evaluating your video and lighting systems, and discussing various solutions in detail with your church staff and volunteers. I then stay overnight to experience your worship services firsthand on Sunday, debrief with the project team over lunch, and return home on Sunday afternoon. I then prepare a written summary of my observations and recommendations and email that to you within two weeks. The report you receive will identify any technical issues or weaknesses of your room acoustics and technical systems. If you wish, we can also observe your tech support volunteers in action and comment on their work as well. Out of that report, we can develop a strategic plan to guide your steps toward improving the technical excellence of your worship services. Please know that if I can offer any specific design advice while I’m there with you, I’ll be glad to do so. Sometimes that is possible. Usually, though, designing those system upgrades involves more extensive work than this weekend trip would allow time for, and would be done under a separate agreement. We would be glad to discuss those options with you when you’re ready. Is yours a DIY church? Lots of churches want to Do It Yourself. 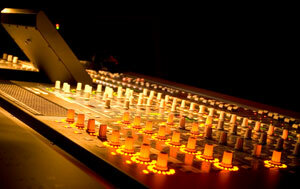 Maybe your church's tech team has the desire to design your new sound, video or theatrical lighting system themselves. They know what they want, but don't have the design tools, software, or knowledge in certain key areas to deliver a proper design. If you prefer the do-it-yourself approach, please know that TMS is entirely comfortable in coming alongside your techs to help them through that design process. We can provide as much – or as little – design assistance as they need over the course of a project. If you prefer a full service solution, please know that TMS is ready and able to take the lead role for the design of all the technical systems. Allowing us to take the lead lets us head off any logistical conflicts before they become a problem. For example, if there is a positional conflict between where a loudspeaker needs to go versus where a production lighting fixture needs to go, we can work that out in-house well before the installing contractor starts to put things in the air. No project is too large or too small for TMS. 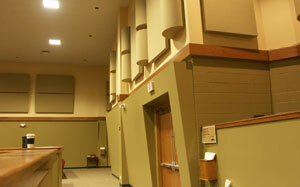 We are comfortable designing acoustics and production systems for churches of any size. The majority of the projects that God seems to be bringing us these days include main auditoriums that range in size from 200 seats up to 2000 seats. Some are traditional, some have very contemporary worship music styles, and a few are high tech youth rooms. We are at home working with all styles. Is achieving unsurpassed technical excellence within your budget realities too much to ask? Not at all. In fact, the seasoned pros at TMS have been partnering with churches on room acoustics and technical support systems for over thirty years. Firsthand experience has taught us that each church project has its own unique set of expectations and technical requirements, and yet the road to technical excellence is similar in many regards. Here are some of the steps we will take as we set out on that journey together. Your church has its own unique way of presenting the message. Our role as your technical advisor includes designing solutions that meet your unique technical requirements and expectations. We set out to discover and understand what those are very early in the design process. We weigh those design goals with your budget realities, and then start putting together some specific solutions for your consideration. Once we are on the same page with the equipment choices and budget window, we develop drawings and written specifications to communicate the AVL systems design and room acoustics design in a very precise manner. Those documents are then shared with specialized contractors who are highly qualified to install the systems according to our design intent. We lead them through a bidding process to help you determine which company best fits your project’s needs. As the installation process begins, we stay engaged as your advocate. We can even handle all communication with the installer if that is your preference. The reality is that any AVL system installer that TMS recommends will employ best of industry installation practices. Even so, we will check on their work periodically to ensure that the systems are being installed properly and according to our design intent. Once the system installation is complete, TMS will return to commission the project. That process confirms that all of the equipment that you ordered has been delivered, installed in a professional manner, and is working properly. We then make final adjustments to the control equipment to ensure that the performance of each system lives up to your expectations. This is a partnership process. At the end of this project, we hope to remain your friend long after your first worship service with the new AVL systems. Many of our clients still contact us for advice six, eight, even ten years down the road. We will answer your phone calls, even early on a Sunday morning when you just realized that something isn’t working properly. We will be your advocate, your partner, your friend throughout this project and long afterwards. We can help you achieve the level of technical excellence that you have envisioned without losing sight of your budget realities. You will never be sorry that you hired us to come alongside you for this project. You may be sorry if you hire someone else. Call us today! Our scope of involvement varies with each project. Here is just a glimpse of the services that we can bring to the table when you hire us as your technical advisors. We design loudspeaker systems using various computer models and engineering tools that allow prediction of results before the construction begins. We are painstakingly thorough during this process to ensure that every seat in your auditorium will be a great place to worship. Of course a computer cannot tell what a loudspeaker sounds like, so we make it our business to listen to as many different products that we possibly can. Our ability to craft great sounds comes from our experience with mic technique, mixing technique, and the tasteful use of effects processors. That background is poured into our choice of equipment for your Front-of-House production booth, along with how that equipment is laid out. The use of video graphics for sermon support and to lift the eyes of the congregation off the hymnal and up toward Him is commonplace in most churches today. The technology for both the video equipment and the graphics software is advancing daily, and we continually stay in touch with manufacturers so that we can bring only the best of the latest technology to our clients. 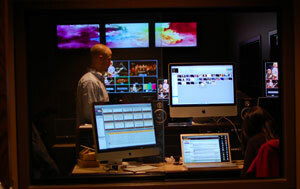 The use of video graphics specifically in the church has given birth to no less than ten different software products for managing the lyrics and sermon notes. Proper lighting for the main platform can have such a powerful impact on the worship environment. Gone are the days of placing can lights in a ceiling and calling it done. Just like a loudspeaker, we need lighting fixtures for the main platform that are controllable, that allow us to put light where it needs to be, and keep it off areas we do not want lit up. 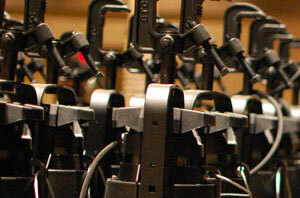 Our design documents include complete details for the choice and placement of the production lighting instruments, along with the technical details needed to ensure that the production lighting system is properly installed, and that it integrates with the house lights in order to provide your tech support team with full production control of the lights in the sanctuary. The auditorium lighting for most projects is designed by the engineering firm working for the architect, however TMS will ask for the liberty to review those plans from a production perspective and to choose how those house lighting fixtures are circuited to best suit the needs of weddings, funerals, and smaller meetings in the sanctuary. Again, we look at even the house lights from a production perspective, something your typical electrical engineer might not take into account during the design phase. Choosing the right acoustic signature for your sanctuary is pivotal to creating a worshipful environment. Which direction to lean the room acoustics depends on your primary use of the space. A traditional style of worship music typically calls for a room that is live and reverberant, while a contemporary style of worship music often works best in a room with a short reverb time and devoid of late-arriving echoes. The spoken word is best understood in a room that is acoustically live yet has a short reverb time. We work with some churches that have multiple services which vary between traditional and contemporary music styles, and want the room to serve both needs. As part of your design team, we work with your architect to ensure that the acoustics of the space are right for your style of worship. A great sounding room can be rendered useless if the heating and air conditioning system is too loud. Mechanical noise can play a critical role in the perceived intelligibility of the sound system for speech as well as the warmth of music heard in the space, and yet we find major flaws in the design of mechanical systems in a high percentage of churches. Your new sanctuary could become a very hostile environment for worship unless we hold our ground on the requirement to achieve a specific Noise Criteria value. We can provide the Church with target noise figures for your Heating, Ventilation & Air Conditioning system designers to consider during their design of the HVAC systems that will serve your new auditorium. Once those plans are submitted, we can perform a detailed study of the mechanical systems design from an acoustics perspective to confirm that the auditorium will have an environment that is conducive to worship. Likewise, a sensitive moment in the service can be disrupted by loud sounds from another ministry located in a room just across the hallway or down in the basement. We look for the potential for such issues as we review the architectural drawings, and bring those to your attention early in the project while they are just lines on paper. Because once the room is built fixing the problem will be way more expensive. We have taught literally thousands of church sound team volunteers, technical staff, worship pastors and musicians how to get the best possible results using the gear they have to work with. Having made his living as a professional musician for 12 years, earning a Bachelor of Music degree in Music Engineering from the University of Miami, serving 11 years full time on the production staff of three churches as Audio Director and Technical Director, plus several more years as a sought-after freelance sound engineer, and now focusing his career on designing state of the art sound, video and theatrical lighting systems for churches nationwide, Curt brings a unique perspective and depth of knowledge to every workshop he teaches. It’s not enough for us to design a great system, make sure it’s installed properly and then walk away. Not only is it in our best interests from a business sense to make sure that your team is fully trained on the gear, but teaching church tech support teams has been a pivotal emphasis of TMS since we started in 1981. 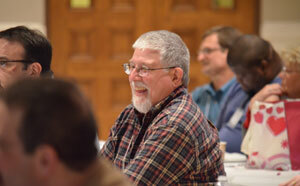 It is our heart to share our knowledge with those who will be operating the systems that we design for your church. As part of our work with your church, we will bring our full educational efforts to bear on your tech support team, leading them to a newfound confidence and a clear understanding of their role.